Adriana is a 28′ Albatros equipped with twin outboard engines. Comfortable seating and an ample shaded area offer a comfortable ride out to the reefs. Ladder for easy water exit. This boat accommodates a maximum 8 divers. 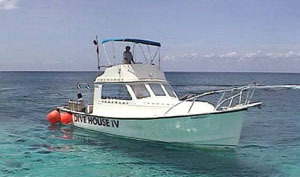 Dive House I is a 42′ Sea Ray boat with a 14′ beam. Spacious and custom built for diving it has an open partially-shaded deck with ample space for divers and their gear. Powered by two 375 H.P. Caterpillar 3208 TA marine engines. It is equipped with a VHF radio, depth sounder, DAN oxygen unit, first aid kit, life vests, head and freshwater shower. The large water level platform and twin ladders allow for easy access to and from the water. This boat can easily accommodate groups of 24 divers, but for individuals and couples, we limit the maximum number of divers to twelve. Dive House II is a 30′ Island Hopper with a 12′ beam. Comfortable and fast, you can enjoy your boat ride out to the reef enjoying the sun or relaxing in it’s large shaded area. Powered by a 375 H.P. Caterpillar 3208 TA marine engine. It is equipped with a VHF radio, depth sounder, DAN oxygen unit, first aid kit, life vests, head and freshwater shower. The platform is at water level and exits are easy using the large sturdy ladder. 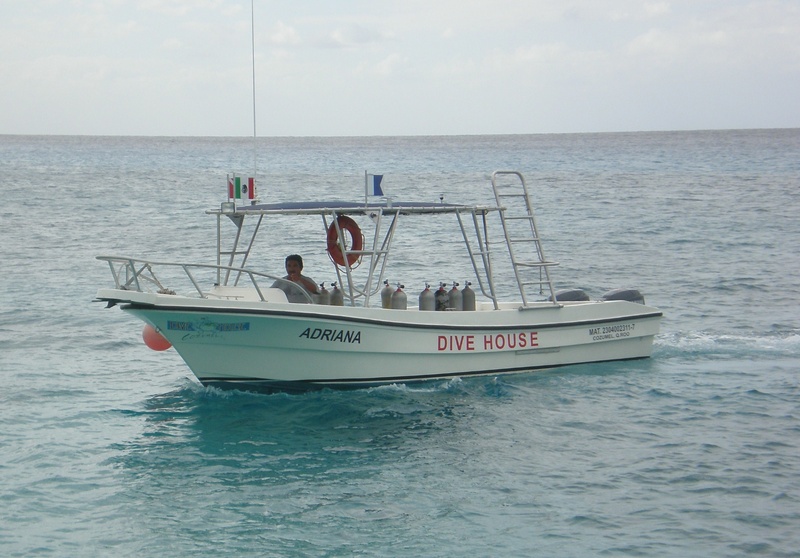 This boat can accommodate groups up to 12 divers, for individuals and couples the maximum number of divers is limited to ten. Dive House III is a 46′ Sea Ray with a 14′ beam. The deck is ample giving plenty of space to move around. Powered by two 375 H.P. Caterpillar 3208 TA marine engines it is equipped with a VHF radio, depth sounder, DAN oxygen unit, first aid kit, life vests, camera rack, head and freshwater shower. Enjoy the sun or relax in the large shaded area. The broad water level platform with twin ladders provides for easy and convenient water access. 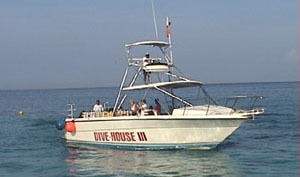 This boat comfortably accommodates groups up to 26 divers, individuals trips are limited to a maximum of 12 divers. 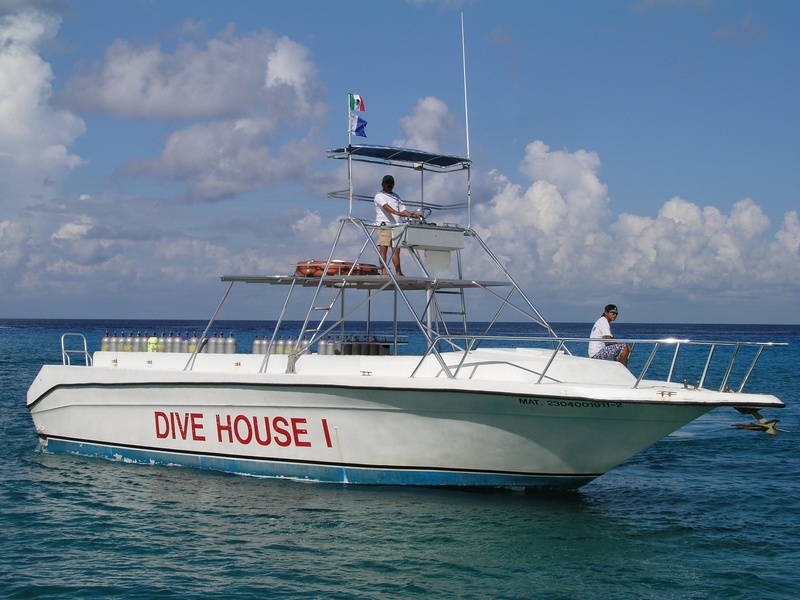 Dive House IV is a 35′ Bruno Stillman with a 11′ beam. It is powered by a 375 H.P. Caterpillar 3208 T A marine engine. It has a partially enclosed deck and comfortable cabin with a head and freshwater shower. It is equipped with a VHF radio, depth sounder, DAN oxygen unit, first aid kit, life vests, camera rack, head and freshwater shower. The water level platform and sturdy ladder provide excellent access for entries & exits. 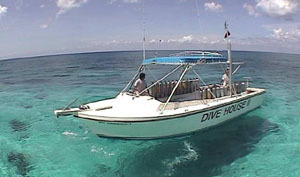 This boat accommodates groups up to 14 divers, tours for individuals are limited to a maximum of 10 divers.